Venues for international events typically showcase what they have to offer. So you would expect the upcoming London Olympic Games to put on display what the city's prime attractions. Once you get passed the dreadful English food, London has a lot to offer. British beer is something that might be of interest to visitors. But it turns out those beers won't be in evidence at any of the Olympic venues. "How's that?" you ask. Well, it's all about the power of Olympic sponsorship and the willingness to force visitors into buying your product only. This story has been widely reported. I first saw it in Beer Advocate and it was also reported here. The just of it is this: Heineken, the Dutch company, paid something like $10 million for rights to be the only branded beer available at the 2012 Olympic events. In London! If other beers would normally be available at any of these venues, tap handles and signage will be removed for the duration of the games. 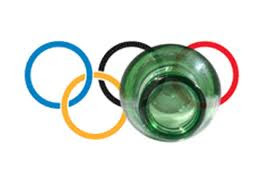 British beers aren't going to be a part of these Olympic games, unless visitors search them out...which some surely will..
As was pointed out in the earlier stories, the timing of the Heineken deal is unfortunate. British brewing has experienced a resurgence in recent years. There are evidently more small brewers operating in Great Britain now than at any time since World War II. Lots of great beer choices around London. But only Dutch lager at Olympic venues. 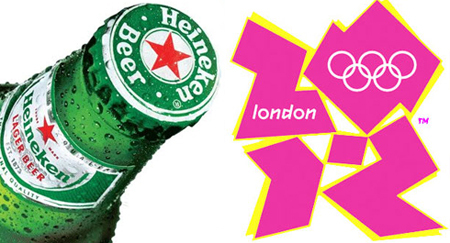 What Heineken did in the case of these Olympics they have done before. At last year's Rugby World Cup in New Zealand, Heineken secured sponsorship rights which meant Heineken and Amstel Light were the only beers poured at games. Imagine the thrill of watching a rugby game while drinking a light beer. What's wrong with this picture? Beyond the irony of a Dutch lager dominating an event in London, it's bad news anytime a gigantic beer company buys up the rights to a sporting event. They do it to push out the competition, including craft beer, and push their own flawed product. We already have issues with this kind of approach in all of the major US sports. Anheuser-Busch is the dominant player. Budweiser occupies taps and advertising opportunities all over the place. You can get a decent beer at many of these places, but you can bet the sponsor agreement restricts your choices. So while you're watching these Olympic Games on TV and absorbing the Heineken signage and advertising, remember arrangements like this are not good for craft beer. The big guys want to paint the little guys into a corner. They do it by spending millions on sponsor deals that limit choice and promote inferior products. Don't buy into it.